Lt Garage Doors love to work with Hormann garage door designs and stop at nothing to ensure the perfect fitted garage doors at your property in Altrincham. Hormann are the market leaders for construction components, gates, frames and garage doors. As one of Europe’s leading providers in quality garage doors, there is no need to look elsewhere! 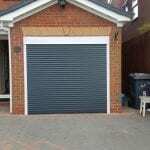 Based on German Engineering, assembled in the U.K for honest, reliable and affordable garage doors. All of the doors that Hormann provide us with are double insulated for extra warmth, fuel saving and security at your home. With all designs coming in ready-to-fit door settings, we are able to supply the readymade garage doors of your dreams with ease. One of the many benefits of being so highly insulated is that you can avoid draughts, unnecessary heat loss and also save energy in the long run, giving you the opportunity to utilise your space for something more than just storage. With the extra thermal insulation and ability to open your garage door in various ways, you can make better use of your garage rather than the traditional car storage method. As more and more homes around the UK are cramped and the funds for moving properties are low, more and more homeowners are expanding where they can – often into the garage. 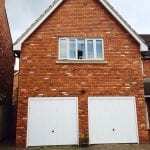 Creating extra living spaces, games rooms, storage and even extra bedrooms, your garage has so much potential when designed correctly with the most suitable garage door. 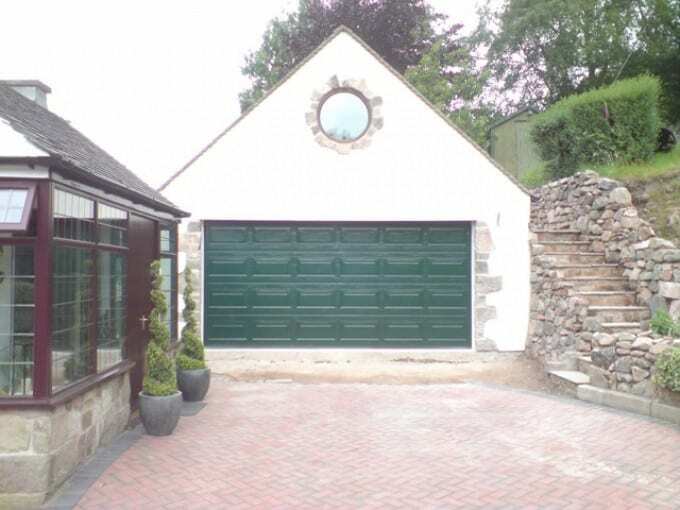 Hormann provide garage doors in various styles including the most popular Up and Over and Sectional mechanisms. With various design styles and finishes to choose from, you are never stuck for choice or functionality at your property. With a further 10 different designs in steel materials, 6 powder coated colours and matching coloured frames you can rest easy knowing the service you get from us never cuts corners. Hormann also provide various finishes, timber colours and 11 GRP (fibre glass) door designs for an increased luxury finish. As well as the peace of mind knowing your garage door is secure and safe, you can also choose the exact colour, finish and design of your garage door. Choosing from woodgrain, sandgrain, micrograin and silkgrain gives you the option to transform your property to suit your style and budget. With more than 200 RAL colours to choose from, the most popular from Hormann include colours such as grey aluminium, clay brown, stone grey, moss green and ruby red to name just a few. With a keen eye on the future and how environmentally friendly they can be as a business, in 2013 Hormann acquired 40% of its energy from greener sources and are looking at increasing this number in the following years. As well as award winning designs, great environmental morals and personalised designs for your home, Hormann are attentive to their customer’s needs just like the team here at LT Garage Doors. Find out how you can get a Hormann quality door at your property in Altrincham by calling us on 0161 930 8791.